Since I saw this boot knife from Kershaw discussed in a recent issue of Blade Magazine I had to take a look. Apparently, runners and hikers in southern California are carrying the Kershaw Military Boot Knife as defense against mountain lion attacks. Honestly, even though this is a decent boot knife, you might need something bigger for pumas. As boot knives go today, the Kershaw Military Boot Knife is better than many -- even though it doesn't actually fit in the boot. Kershaw supplies a web belt and sheath which should strap to the leg or arm easily, but not always comfortably if you're a runner. On long runs, belts tend to chafe, so wearing this nine-inch fixed blade at the waist could be a better idea. 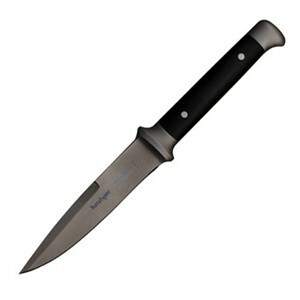 With a 4-1/2-inch blade of German 1.4116 high carbon stainless steel, this boot knife does outdo most clip folders in terms of penetration, and the knife also doubles as a handy camp knife and emergency tool. At only 4.4 ounces, it won't be noticeable unless you strap it to arm or leg on a long run. Then you'll probably hate it. Still, with drop-forged blade and bolster and full tang handle, this diminutive fixed blade does offer strength and practicality many other boot knives lack. POM handle slabs, triple riveted and rugged, provide enough gripping surface for dependable use. The forged steel end bolster gives the Military Knife at least a minimum of hammering strength, and for the tactical user, the bead-blasted finish eliminates that telltale shine. Though it's a fine boot knife with a functional conventional build, the Kershaw Military Boot Knife really isn't a practical defense against mountain lion predation. In that sense, it's only a little better than bashing a big cat with a cardio monitor. Runners in California might consider something with a longer reach and more weight.